Microwaves are one of the cheapest products you can buy now online or in store. 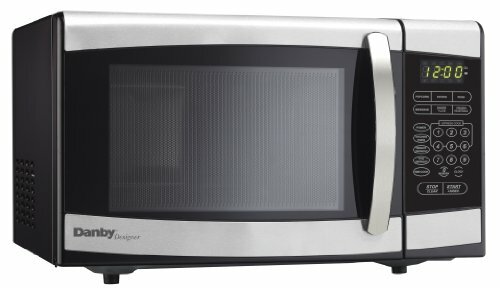 You can get a microwave for as little as $50, or as much as $200. 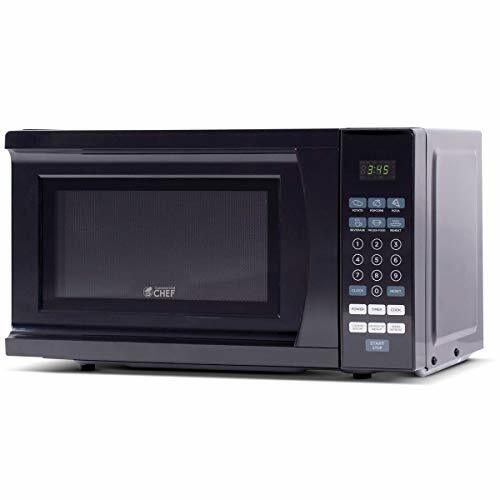 If you are on a budget, you should not have any problem finding an affordable microwave. The best cheap microwave that I came across is Westinghouse WCM770B. If you have a good product, it can last for years. Scroll down for a list of best budget microwaves money can buy. All the microwaves in this list are less than $100. I couldn’t find a better microwave oven than this one so I’m going to call it the best cheap microwave. It’s compact enough for the average sized kitchen and comes with 10 cooking power levels. There are 6 quick cooking settings to make popcorn, pizza, baked potatoes, and for reheating frozen dinners. It only consumes 700w of power. The display includes a clock and a kitchen timer as well. Also, there’s a childproof lock. All in all, this is a feature-rich microwave well worth everything you spend. This very stylish microwave is very suitable for smaller apartments and studios. It has a lovely stainless steel exterior and comes with 10 power settings. There are 6 quick cooking buttons too. The capacity is 20 liters. It has a turntable (carousel plate) as well. Overall, it’s a great microwave. 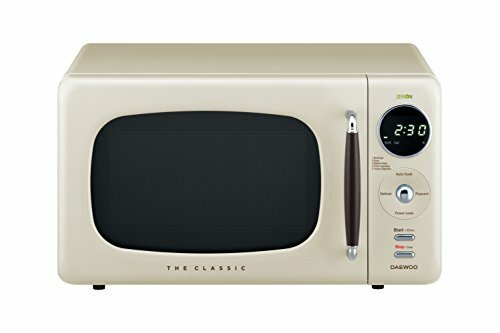 Daewoo’s nostalgic cream-colored microwave would look stunning in any kitchen. But looks aren’t everything here. This 700W microwave offers a number of interesting features. It’s designed with what’s called a Concave Reflex System. It’s a technique that emits micro waves more efficiently. The oven has a little knob to set time. It comes with 5 power levels. There are 5 auto cook options as well. The turntable is recessed to prevent misplacement during operation. The defrost function stands out. Unlike with other microwaves of the same size, the defrosting is fast and smooth. Nearly all of the features are great. If there’s anything for concern, it’s probably the size. This microwave is slightly large, so the standard 12.5-inch shelves might make it stand out. Overall, the product is great. You can count on getting the best value for the money you spend. This microwave has a very stylish red chrome exterior. It has 6 one-touch programs for things like heating up beverages and frozen vegetables. It also has two automatic defrost options based on weight. More importantly, it has multi-stage cooking, which means that you can adjust settings while a meal is being microwaved. This is a good option when you want to defrost something first and then cook. You can trust that this product will last several years. I’ve had mine for almost one, and it has proven to be quite great at what it does so far. I can’t say I’ve encountered any problems with this microwave oven. 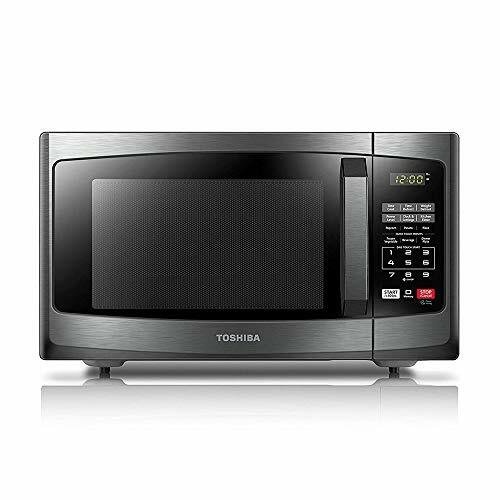 This Toshiba microwave is compact, easy to use, and an all-around workhorse suited for small family kitchens. The exact size is 19.2 L x 15.9 W x 11.5 H inches and it operated on 900w of power. The microwave comes with 10 power settings for cooking and heating food. It can defrost food by eight as well. There are one-touch functions for cooking snacks like pizzas and popcorns in a jiffy. There’s a built-in kitchen timer. The biggest perk is the beeper, which is significantly loud. The turntable is glass and is very easy to clean. The exterior is made from stainless steel, painted black. The rust issues are minimal. The microwave has a power saving mode for those who need it. However, this isn’t a certified eco-friendly model. What’s more, the microwave has a child safety lock. The little ones won’t be able to accidentally get hot popcorn all over themselves. 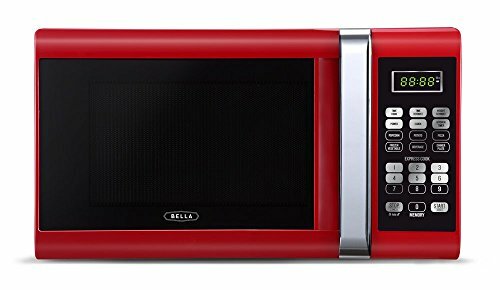 Overall, this is an excellent microwave that will suit just about any family kitchen. The compact size limits the capacity inside, and that’s the only issue. Most users want microwaves to reheat, defrost and cook food. So, you must look for these essential functions when buying a microwave. Microwaves with pre-programmed buttons for things like making popcorn or heating up rice can take the guesswork out of most tasks. So, it’s worthwhile to invest in a bit more for a microwave with features that simplify the cooking process. The external dimensions will tell you how much space you need in your kitchen to place the microwave. Internal dimensions are important because these measurements will tell you how big a food container you can fit inside. Some budget microwaves are very small and can only accommodate smaller plates and dishes. For home use, you may wish for a microwave with ample internal capacity. So, carefully check these measurements before you buy. Buy a microwave oven with a turntable, a.k.a carousel plate. These things rotate automatically inside. Otherwise, you will have to open the lid and manually turn the dish when heating, which is just a hassle. Microwaves with metal racks are better at distributing heat. If you are sick of microwaves that heat up only the top or bottom layer of food, buying one with metal racks will solve the problem. If you want the microwave to cook your food faster, look for higher wattage ovens. The higher the wattage, the faster your meals will be ready. Usually, the bigger microwaves offer the highest wattage levels.